Lazy Cakes Leave You, Well, Lazy Lazy Cakes' "The Original Relaxation Brownie" is one of a few new products being stirred up to cool off the energy-boosting products craze. 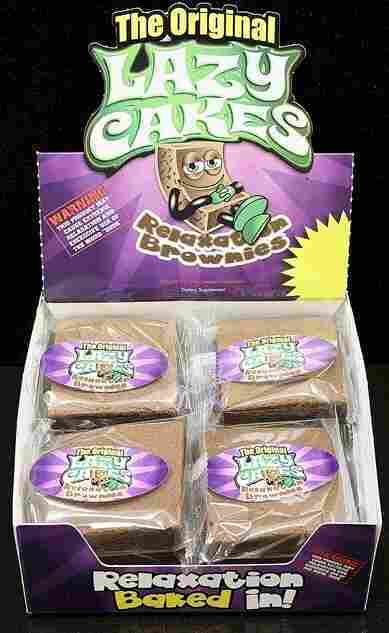 The brownies are selling like hot cakes in convenience stores and gas stations in several states. Still, laziness seekers are cautioned not to gorge on them. Lazy cakes contain melatonin, which occurs naturally in the body and is a common sleep aid. But one toxicologist says that large quantities of melatonin can lead the central nervous system to slow down and cause trouble breathing. Convenience stores are filled with energy-boosting products; it seems some companies would be happy if we never slept a wink. But now there's a movement in the opposite direction: products with names such as Simmer, Unwind and Lazy Cakes. That last one, Lazy Cakes, is a particularly hot seller. It's a reasonable suspicion for customers to be a little wary of the fudgy brownies with the psychedelic purple package for sale next to the cigarette lighters at gas stations. 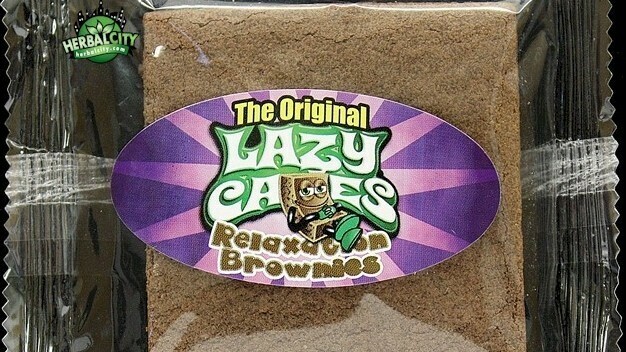 The label says Lazy Cakes are "The Original Relaxation Brownie." Even at $4 apiece, a clerk at a Charlotte, N.C., gas station says she sells about 36 a week. In the five months since Lazy Cakes hit the market, co-creator Tim Barham says they're available in two dozen states and sales are doubling every month. "It's definitely not a pot brownie," says Barham. "Things that are in this brownie have been used for years to relax. [Such as] melatonin, valerian root, rose hips. Standard stuff you can pretty much buy at any Walgreens or Walmart or anywhere." A promotional box for Lazy Cakes like those seen in convenience stores in a growing number of states. Those ingredients are true, but look up Lazy Cakes online and the secret to their initial success is pretty obvious. Rumors are rampant they contain the same synthetic marijuana compounds found in herbal incense products like Spice or K2. "There is an effect with Lazy Cakes, but I wouldn't say it's comparable to marijuana at all," says Niki D'Andrea, who bought one while at a shop that sells drug paraphernalia. D'Andrea's not shy about having tried both; it's part of her job writing about subculture for the Phoenix New Times. She didn't get high from the Lazy Cake, but she was shocked at how sleepy it made her. "I really did go to bed for about, I think 10 to 12 hours after I ate that first Lazy Cake, so well, maybe I should have started with half," D'Andrea says. Actually, half is the recommended serving size. As if anyone ever just eats half a brownie. Read the fine print and you'll also see Lazy Cakes are for adults only and should not be mixed with alcohol or eaten before driving. It's the usual FDA-required label you find on dietary supplements, and that makes them legal. But Lazy Cakes are sold in gas stations by clerks who often have no idea these aren't normal brownies. They're packed with melatonin, which occurs naturally in the body and is a common sleep aid. Anna Rouse Dulaney, a toxicologist with the Carolinas Poison Center, says that "eating the whole brownie would be about twice the recommended dose." She believes it's only a matter of time before calls start coming in about Lazy Cakes. In large quantities, Dulaney says, melatonin can lead the central nervous system to slow down and cause trouble breathing. More commonly, people just get really sleepy and maybe nauseated. Children are at greater risk. There's been at least one report of a toddler in Tennessee eating a Lazy Cake and ending up in the hospital. National poison center data show melatonin prompts more calls than any other herb or supplement. In 2009, about 5,000 melatonin-related calls came in to poison control centers, most involving small children. None died. But the makers of Lazy Cakes have decided to put a "not for children" warning on the front label of their brownies. Dulaney says that might not be enough. "A child who can't read who just finds this in the house is at great risk because it looks just like any other brownie," Dulaney says. Still, it's not the most dangerous thing Delaney's seen. Phillip Hunt, 28, discovered Lazy Cakes at a shop in North Carolina last month and now eats about six a week. He says "lazy" is the perfect name for them. "If I eat a Lazy Cake and the remote's on the other side of the room, I actually watch a channel for an hour or two," Hunt says. Relaxing folks is going so well for the makers of Lazy Cakes, they'll soon launch a product with the opposite effect: caffeinated brownies called "Up Cakes."